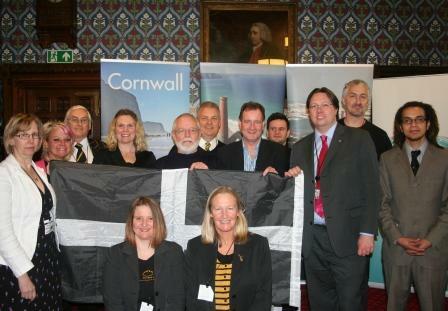 North Cornwall MP Dan Rogerson has hosted the second annual St Piran’s Day reception in Parliament. Following events across the Duchy on Monday, Tuesday’s event in Westminster attracted MPs, members of the House of Lords and Government ministers from across the UK who came to learn more about Cornwall’s unique culture, heritage and identity. Performer and educator Will Coleman and Cornwall Councillor Bert Biscoe joined Rogerson to inform Parliamentarians about Cornwall, its history, heritage and the challenges facing the Duchy today. MAGA, the Cornish Language Partnership, provided some Cornish lessons, and were joined by representatives of community interest company Azook.org.uk which involves Cornish communities with their culture and heritage, London Cornish Rugby Club and Pauline Giles from Par who runs the BosomBuddiesUK breast cancer charity. In addition information was available from Visit Cornwall, Business Cornwall, Cornwall Arts in Health and Cornwall World Heritage Site. Parliamentarians also got the chance to sample some fine Cornish produce, with pasties and hog’s pudding being generously provided by Ann’s Pasties of The Lizard and Sharp’s Brewery at Rock offering samples of its Doom Bar beer. Rogerson commented: “When we arranged the first event last year I wasn’t sure how successful it would be, however we had a great attendance and that record was maintained this year. “The aim is to increase understanding of Cornwall’s Celtic heritage and culture in order to inform future debates on devolution, identity and government policy. @CornishAssembly Wld be good to extend the invititation to us Cornish plying our trade here in the capital too next year . . .
@mark_elton Will see to it. Organised slightly last minute this year. Much better (and earlier) organisation next time.